Published Apr 1, 2019 By Julia 6 CommentsThis post may contain affiliate links. 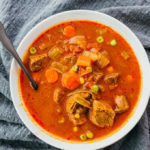 This chicken and sausage gumbo is an easy dump-and-go Instant Pot dinner, resulting in a thick stew with vegetables and Cajun spices. Great for keto, low carb, paleo, and whole 30 diets. 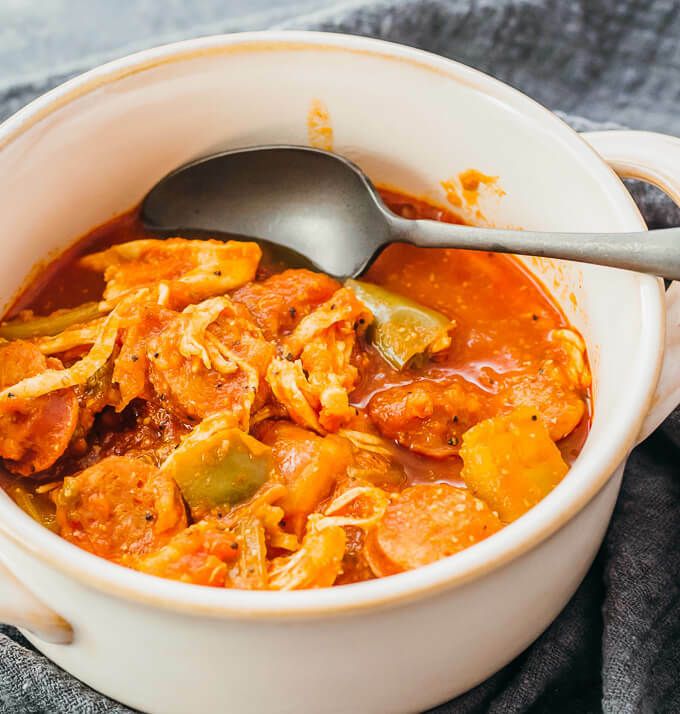 Meat: This gumbo uses andouille sausage and chicken breasts. The andouille sausage can be replaced with your favorite type of sausage, and you can substitute either of the meats with seafood. 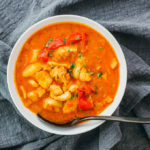 If you opt for shrimp, I recommend adding it after pressure cooking, stirring it in for a minute or two on the saute setting until cooked through. Spices: The recipe includes a homemade Cajun-style seasoning mix, composed of dried thyme, garlic powder, paprika, salt, pepper, and cayenne. 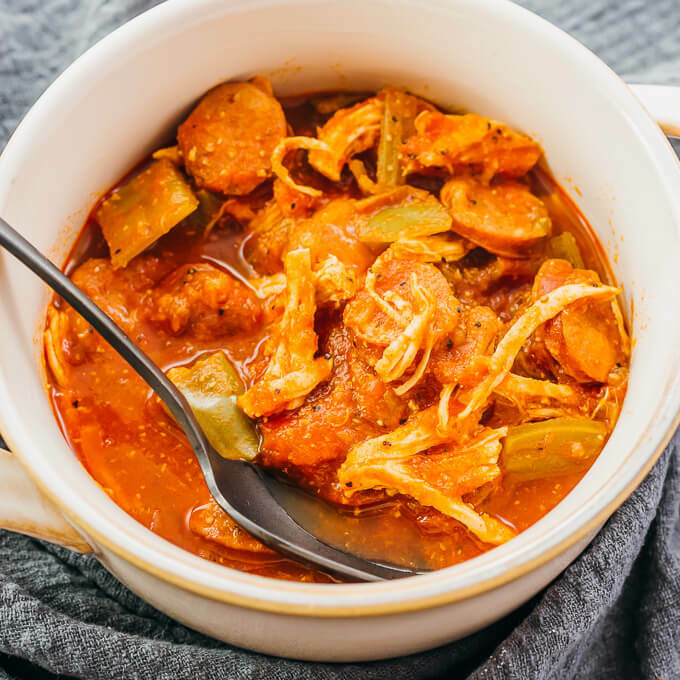 I’d rate this gumbo as medium spicy, but since this varies greatly from person to person, you can add or subtract spices so that the overall heat and flavors match your preferences. If you have a very low tolerance for hot spices, I recommend omitting the cayenne and reducing the paprika by half. You can also keep things simple and enjoy the gumbo by itself — this is what I usually do. For leftovers, cover and store in the refrigerator. Reheat using the microwave. 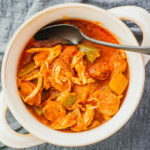 This chicken and sausage Instant Pot Gumbo is an easy dump-and-go pressure cooker meal, resulting in a thick stew with vegetables and Cajun flavors. Great for keto, low carb, paleo, and whole 30 diets. Pat chicken breasts dry with paper towels. Cut into a total of 6 evenly-sized pieces. 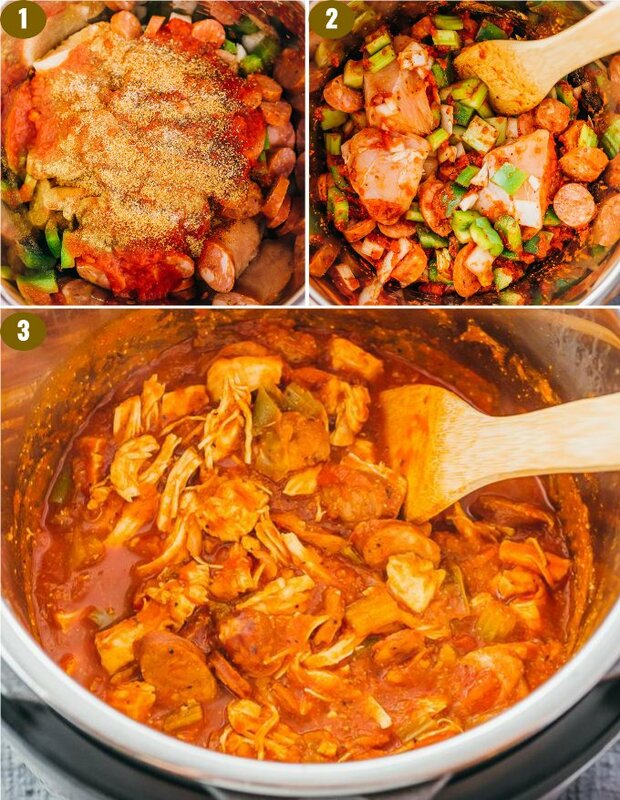 Add all of the ingredients to the pressure cooker pot, and briefly stir everything together. Secure and seal the lid. Cook at high pressure for 10 minutes, then manually release the pressure by gradually turning the release knob to its venting position. Uncover. Transfer the chicken pieces to a large plate and shred the meat using 2 forks (or shred directly in the pot). Transfer the shredded chicken back to the pot, and stir everything together to let the meat soak up the sauce. Optional For Thicker Stew: Turn on the saute setting to medium heat. Boil until the liquid thickens to your desired consistency, 5 to 10 minutes, stirring frequently. Turn off the saute setting, and serve while hot. Amazing! 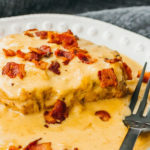 I have tried alot of low carb keto meals that were too fatty and heavy. This was just right with the perfect amount of spice. I added shrimp after pressure cooking was complete. So good and so easy! Do you add water or broth? Neither. Refer to the recipe’s listed ingredients. Would okra get too mushy if I, also, added sliced, fresh okra to this? This looks amazingly simple and yummy. However, I do not have a pressure cooker. 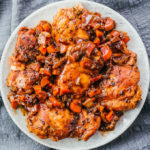 Do you know if a crock-pot would work with this recipe? If yes, can you convert cooking time for a crock-pot or suggestions? I think a crockpot would work well for this recipe. I suggest trying 3 hours on high. Basically, you want the chicken to be cooked long enough so that it’s easily shreddable.